I really sorta like this for the same reason I like shadow mage infiltrator and dark confidant. I think the difference here is that this can very realistically be attacking on turn 2 off a returned mausoleum wanderer. If it was just another Ninja of the Deep Hours I would look the other way, but I think the potential to combo this off brainstorm and do additional damage turn 2 is a big enough threat that it may merit consideration as a one of. Feels like it would find a home in a Edric, Spymaster of Trest BUG list perhaps. Ninja of the Deep used to be a semi-popular / good card in Fish. I’ve played Prophetic Flamespeaker in Fish and it was really good. I like this card. Maybe there’s some good ETB effects you can use with this like Baleful Strix. Why would you play this card over dark confidant? Also, I don’t think any deck runs even a single Confidant, let alone confidant #4 which is still clearly better than the first copy of this card. It’s a cool card, just not vintage or legacy playable. You will constantly be flipping over cards that do 0 damage in vintage. The only exception would be force of will. Trying to trigger ninjutsu makes your deck bad. Standstill is really the only reason in Vintage. It's also more resilient to 1 damage effects. This card cannot be compared to any card in the slightest. I really like this card. Encourages aggro strategy and may even enable combos. I'm starting at full play set and going from there. @ten-ten i think comparing it to ninja of the deep hours is reasonable; given its legendary nature it's possible the first deep hours is better than the 4th yuriko. I ran Ninja of Deep Hours in my landstill to much success. This could be much better, especially alongside Jace TMS. 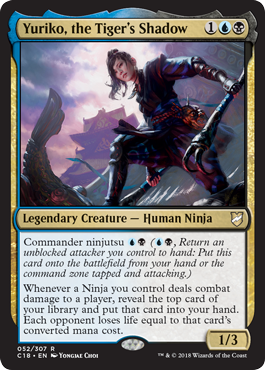 Putting Dig, Cruise, FoW, JTMS, Misdirection, or Mindbreaktrap on top turns this little Ninja into a serious threat. @blindtherapy ok, maybe slightly. Lol. but I think NTDH is where it ends. Now despite this list being very long and not even complete, I dont think any of these cards are seeing play right now. That isnt to say that this card isnt playable, but it is to say that this card has to succeed in an area fairly saturated in with good cards that arent seeing play. What it does better it seems is that it is a better clock than most of these other cards. It's also on the higher side of synergy with other creatures along with Edric, Ninja, and the new Azra Oddsmaker. Its also blue so it pitches to Force. So it certainly has a number of benefits that if you can leverage then it can be a better option than others. What it does worse than others is getting through blockers, and it needs to attack unlike Bob, Strix, Visitor. Unlike Finkel or Selkie, it doesnt have evasion. Unlike Ohran Viper or Flamespeaker, it doesnt have a mechanic to punish blockers. So I think certainly it needs more help in order to trigger compared to these cards. So where are we at in terms of a deck to maximize this card? Plays Snapcaster, Clique, Trinket Mage and/or other creatures with CiP effects. Plays enough high CC spells / Sensei's top to maximize damage. It sounds awful close to wanting to be in an Outcome deck, except for the last part of needing cards to clear its path.